Vegetarian Stuffed Acorn Squash is a hearty vegetarian main or side dish for your holiday meal. This sweet squash is brimming with savory vegetables and nutty grains! While most Thanksgiving menus center around the turkey, vegetarians are often left wondering what their options may be when invited to someone else’s house. It’s such a thoughtful gesture for the host or hostess to include a special main dish for their vegetarian guests. 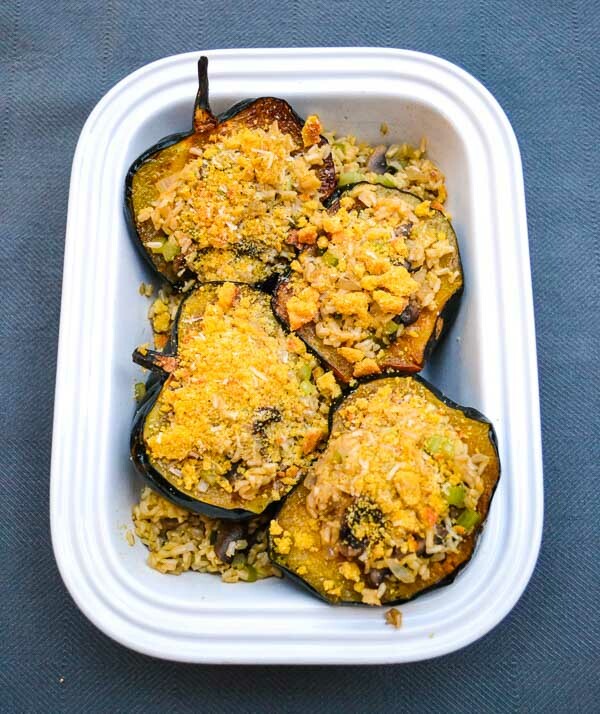 Vegetarian Stuffed Acorn Squash is a simple and filling recipe that is guaranteed to please everyone around your holiday table. The sweetness of the squash is cut with the savory filling resulting in an explosion of flavor. Also, this dish can be prepared ahead of time and quickly reheated prior to serving your holiday meal! Preheat oven to 375°. First, wash and cut each acorn squash from stem to end. Remove seeds from the inner core using a spoon. Shopping Tip: Select similar sized squash for even cooking. Place each squash half flesh-side down on a parchment-lined baking sheet. Cook rice on stove top while squash is baking. Chop and slice all additional vegetables. 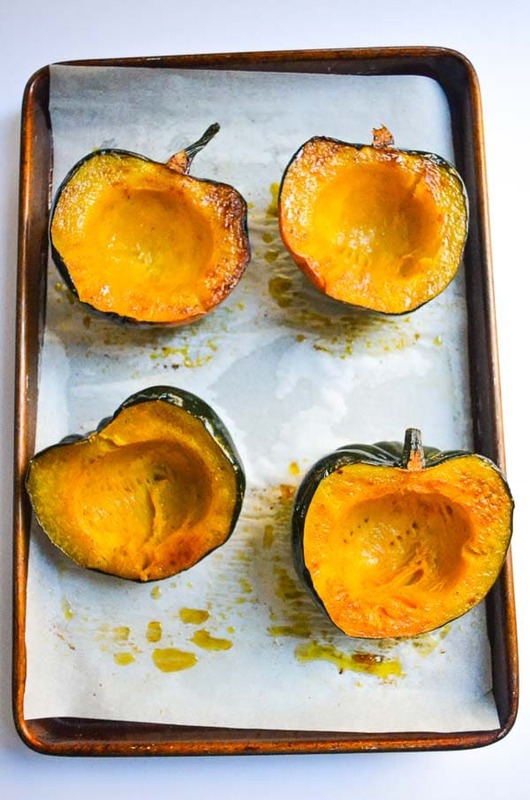 Bake squash for 30 minutes or until fork tender and remove from oven. Heat vegetable oil in sauté pan. Sauté onions and celery for five to six minutes until soft. Add mushrooms, garlic, thyme, sage, salt and pepper. Sauté for another three to four minutes. Combine vegetable mixture with cooked rice. Fill each squash core with rice mixture. 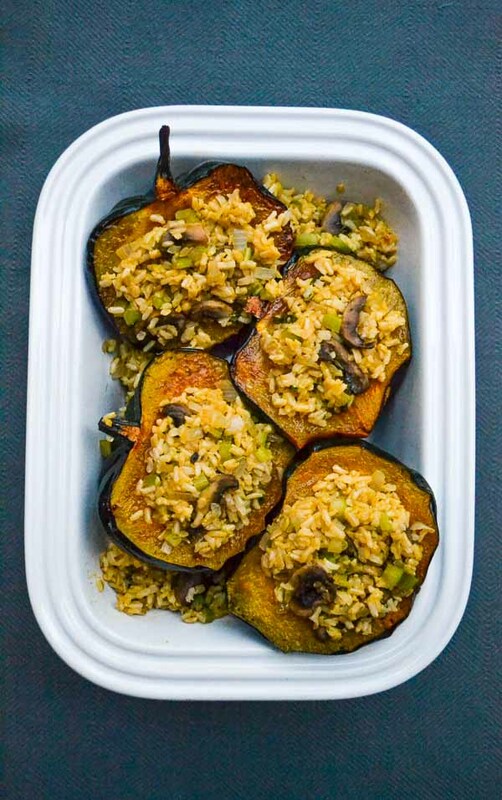 Tasty Tip: If you have excess rice, transfer the squash to a casserole dish before filling. Once each half is filled, spoon the extra rice around the squash. Bake squash for additional five to ten minutes depending on length of time cooled. While stuffed squash is baking, crumble prepared cornbread in a small bowl and mix with shredded Parmesan cheese. If you’re preparing this dish at Thanksgiving, prepare homemade cornbread for your dressing and save a small amount for this cornbread topping. Otherwise, you could buy a small amount of cornbread from your local bakery. Remove squash from oven and sprinkle each half with cornbread topping. Bake an additional five minutes until topping is golden brown. Feel free to adjust serving amounts in recipe card to prepare more or less depending on your party size. The rice mixture is really tasty and you may want to double the amounts of rice and broth for an additional side item. Vegan Adaptation: Omit cornbread topping. Mix nutritional yeast into rice mixture for flavor. Gluten-Free Adaptation: Substitute gluten-free cornbread mix in Southern Skillet Cornbread recipe. This dish is equally tasty without any topping! Please let me know if you try my Vegetarian Stuffed Acorn Squash by leaving a rating and comment. Also, please tag @restandrelish on Instagram or Facebook if you make this recipe. It’s so fun to see your creations! Don’t forget to pin the recipe to Pinterest if you plan to try later. Vegetarian Stuffed Acorn Squash is a hearty vegetarian main or side dish for your holiday meal. This sweet squash is brimming with flavor including savory vegetables and nutty grains! Preheat oven to 375 degrees. Place parchment paper to cover a medium-sized baking sheet. Cut squash in half stem to end and scoop all seeds from core. Brush each half with olive oil and sprinkle with salt and pepper. 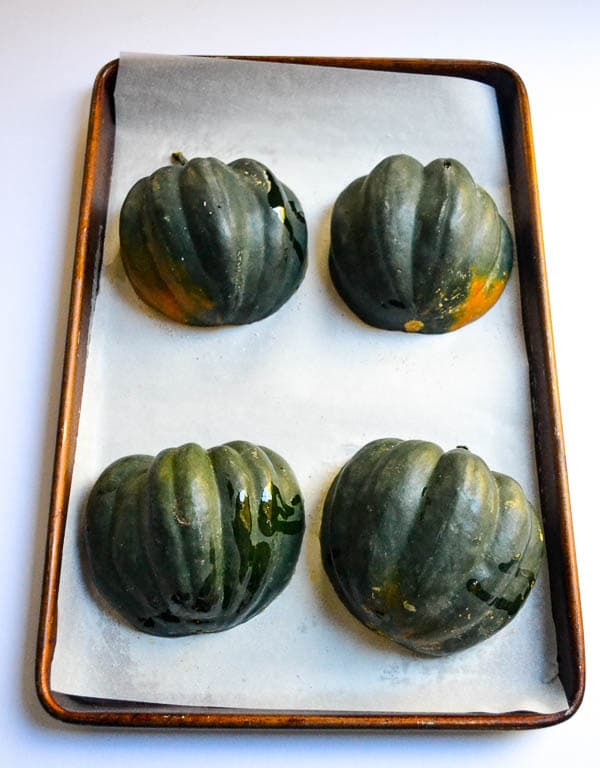 Place squash halves flesh side down on parchment-lined baking sheet. Bake for approximately 30 minutes or until flesh is fork tender. While the squash is baking, combine rice and broth in a small saucepan to bring to a boil. Cook according to package directions. Prep all vegetables and set aside. 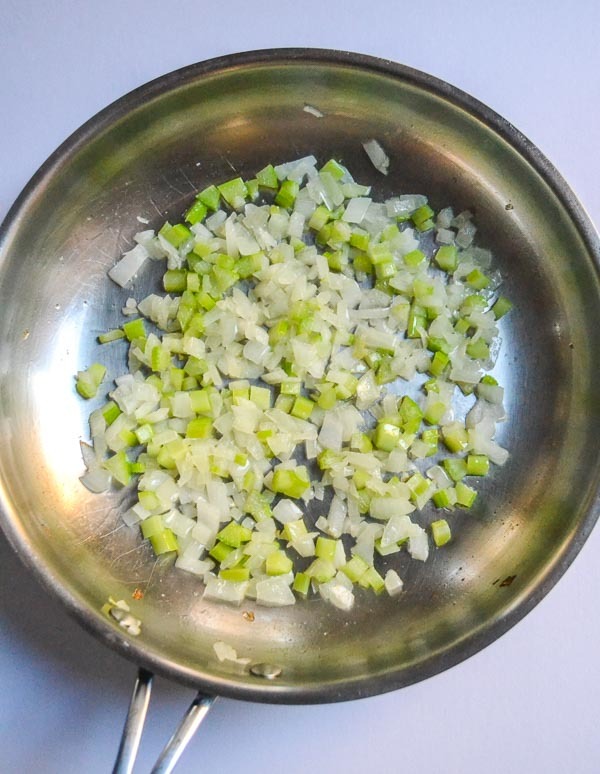 Heat vegetable oil in a saute pan and when hot, saute onions and celery for 5-6 minutes. 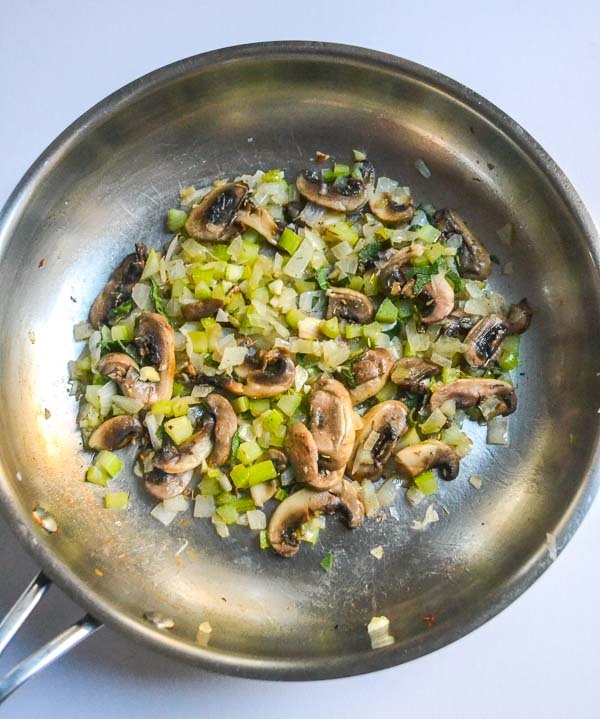 Add mushrooms, garlic, sage, thyme, salt and pepper to saute for 3-4 minutes until tender. Mix vegetable mixture with cooked rice and set aside. 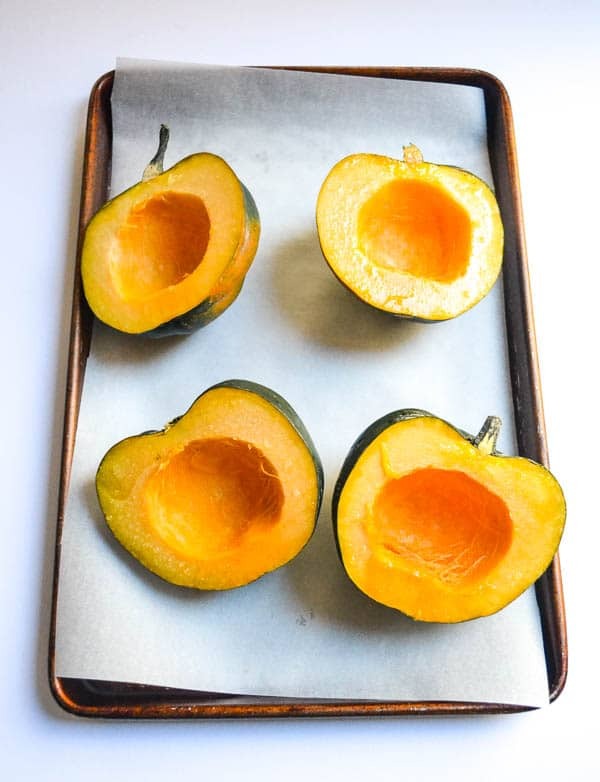 Remove squash halves from oven and reduce oven heat to 325 degrees. Once squash halves are slightly cooled, fill with rice mixture. 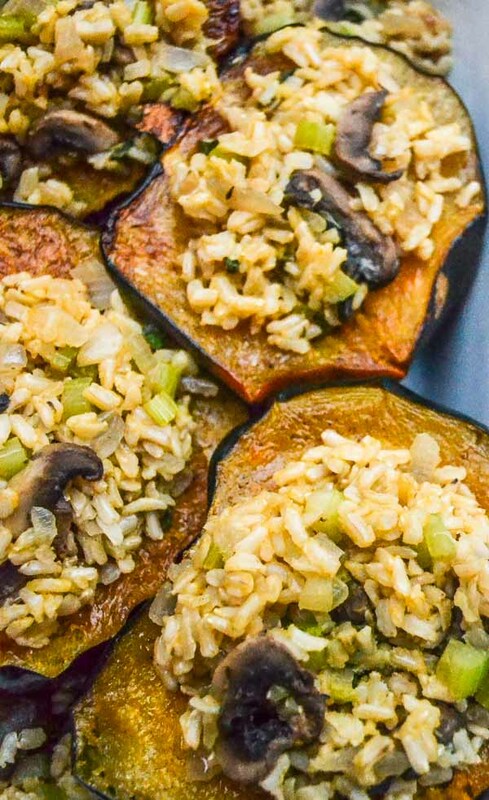 Once oven temperature reaches 325 degrees, fill each squash half with generous portion of rice mixture. Bake for additional 5-10 minutes. Crumble prepared cornbread in a small bowl and combine with Parmesan cheese. Remove squash from oven, sprinkle each half with cornbread topping and bake for an additional 5 minutes until topping is browned. 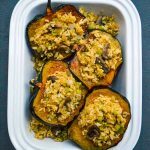 If you have excess rice/vegetable mixture, you can transfer the squash to a casserole dish and spoon additional rice around the squash. Omit cornbread topping for a gluten and dairy-free recipe. This recipe can be prepared in advance and reheated in the oven when ready to serve.